We believe that, given the right tools, all children can be confident, enthusiastic mathematicians. From the moment that they start school they begin to explore numbers, using interesting objects that they can count and manipulate. We provide them with a wide range of interesting resources and models to help them build their understanding of key mathematical concepts with confidence and enjoyment. Having resources such as Numicon and Dienes allow the children to develop a concrete understanding of numbers before moving on to the abstract. As part of a mixed-age class, each child is immersed in an environment rich in mathematical vocabulary, whether it be working out the daily temperature in Class One or taking part in 'Number of The Day' in Class Two. Our teachers know each child very well and so can tailor the lessons to each child's individual ability. We use ‘Know it, Use it and Solve it’ challenges, meaning that pupils learn key skills and then practise and apply them to deepen and extend their understanding. This approach enables all pupils to be challenged throughout the lesson, as well as allowing for pupils to work at their own pace. Teachers don’t follow a strict scheme of work, but use a wide range of planning resources and tools, taking in to account the pupils’ individual needs and abilities. In Key Stage 2, as well as their daily lessons, during which they are taught in groups and given individual support, pupils have a fortnightly focus guided maths session, where they work in a small group with the teacher in order to recap, reinforce or deepen learning in key areas. The pupils are also given practice time to work independently on the focus skills, sometimes using the ‘Sumdog’ or 'Mathletics' programmes, a fun way of practising skills on line. 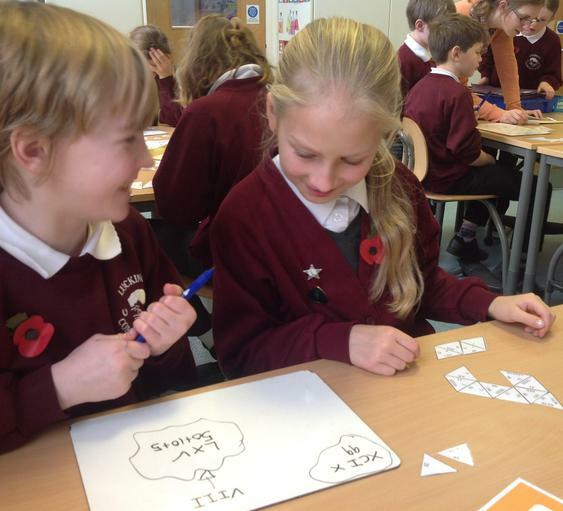 In order to be fluent in all areas of mathematics, it is essential that pupils have good mental arithmetic skills. Beginning in Year 1, pupils practise their mental arithmetic daily through the use of ‘mental minutes’ challenges, completing as many mental arithmetic questions as they can in one minute. At the start of each lesson there is always mental maths activity, which encourages discussion about different mathematical strategies. In Key Stage 2, pupils are able to practise their mental arithmetic through mental minutes, as well as online games, such as ‘Sumdog’, ‘Mathletics’ and ‘Times Tables Rockstars’. They also take part in ‘Number of the Day’, at least once a week, which involves looking at a multitude of number facts about one number, reinforcing mathematical vocabulary. Times tables are taught in both Key Stages and in Key Stage 2 pupils take part in ‘Rainbow’ times tables tests, where they have to complete a set amount of times tables in a given time to move on to the next level. The final challenge is the violet certificate, for which pupils have to complete 100 times table multiplication and division facts on all the times tables up to 12 x 12.